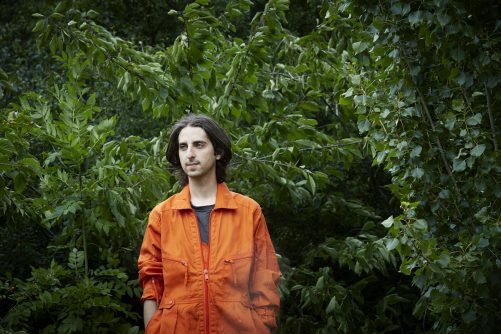 Electronic composer and DJ James Holden performs a unique show at the Royal Exchange, playing works from his latest album ‘The Animal Spirits’. Let yourself be transported to a magical other world of instinct and intuition with this bold new set of synth-led folk-trance standards from the British electronics guru and his newly-expanded band of fellow travellers, The Animal Spirits. A wild ride that unites the characteristic propulsive melodic vigour of his custom-made modular synthesizer system with an unlikely supporting cast of brass, wind and live percussion, the expansive and transformative psychedelic journey of The Animal Spirits is certainly eternal outsider Holden’s most ambitious work to date – but surely also his most direct and accessible. Since the release of 2013’s epic pagan saga ‘The Inheritors’, the kraut-tinged synth-and-drum core of the live touring outfit assembled by Holden to spread his alternative electronic message around the world has picked up several additional members along the way. Legendary jazz band leaders Don Cherry and Pharoah Sanders provided the blueprint for this quest to assemble “something like a spiritual jazz band playing folk / trance music”, but here cornet (Marcus Hamblett) and saxophone (Etienne Jaumet) function as the complement to the star soloist of Holden’s ever-strident synth. Meanwhile drummer Tom Page is inextricably bound to Holden’s synth care of self-coded interactive drummer-following software, keeping pace with the almost imperceptible – yet unmistakably human – micro-errors in timing which lend live drums their natural magical groove. Thus Holden’s drummer is liberated from the brutal tyranny of the click track and a new organic symbiotic relationship between human and machine is unlocked. Producer Holden’s creative control over the project is absolute, from building his own synth and software, writing the musical backbone and steering his players, to self-recording, self-mixing and eventually also self-releasing the finished collection on his own imprint. This heady blend of the electronic and the acoustic came into being during the hot and sticky summer of 2016 under the direction of fledgling band leader Holden at his Sacred Walls studio in London. In a bid to capture what he calls the unfakeable “psychic communication” of a group performance, The Animal Spirits was recorded live in one room together in single takes, no overdubs, no edits, in accordance with his own self-imposed dogma. Support comes from Virginia Wing vs XAM Duo.